The Dumeril’s or Brown Rough-Necked Monitor (Varanus dumerilii) is still collected from the wild, but captive breeding is increasing, and will, I hope, soon be the rule rather than the exception. Although the black and orange hatchlings are hard to resist, Dumeril ownership should not be entered into lightly. Strong and active, adults may top 4.5 feet in length, and are best reserved for those with adequate space and experience. That being said, Dumeril’s Monitors are reputed to be somewhat easier to handle than other similarly sized species. My own experience bears this out, but individual personalities vary greatly…caution and respect for their powerful jaws and sharp claws is a must. For those up to it, this is definitely a species worth considering, as it is little studied in the wild and unprotected across much of its range (and a very interesting creature as well!). 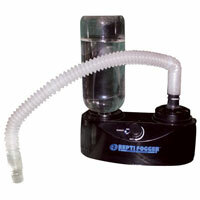 Humidity should average 70-85%, but dry areas must be available. 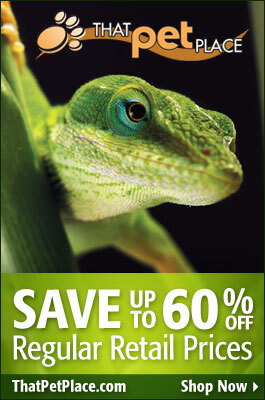 A commercial reptile mister will be helpful if your home is especially dry. The few available studies indicate that wild Dumeril’s Monitors take a wide variety of prey animals, including grasshoppers, roaches, and other large insects, frogs, crabs, snails, bats, rodents and other small mammals, birds and their eggs, turtle eggs, and fish. Populations living in mangrove swamps seem to favor crabs and snails…in my experience, crabs and crayfish always elicit a vigorous feeding response from captives. I do not use a rodent-only diet for these or other monitors from similar habitats (i.e. 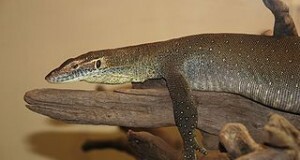 the Black Rough-Necked Monitor). Youngsters should be fed largely upon roaches, super mealworms, earthworms, snails, hornworms and other invertebrates, along with small whole fishes, un-shelled shrimp, fiddler and green crabs, crayfish and squid. Pinkies or small mice may be provided once weekly, and hard-boiled eggs can be used on occasion. All meals (other than fishes, crabs and rodents) offered to growing monitors should be powdered with calcium, and a high-quality reptile vitamin/mineral supplement should be used 3x weekly. I favor ReptiVite and ReptiCalcium. Rodents and whole fish can comprise 50% of the adult diet, with a variety of large insects, earthworms, hard-boiled eggs, crayfish, crabs, shrimp, snails, and similar foods making up the balance. Calcium and vitamin/mineral supplements should be used 1-2x weekly. Large food items should be avoided; even where adult monitors are concerned, mice are preferable to small rats. Although not a species for beginners, Dumeril’s Monitors adjust well to captivity when given proper care, and make fine, long-lived pets. Initially shy, some learn to trust gentle caretakers, while others – especially wild-caught individuals – remain wary. A large, well-furnished cage will provide the security that is essential if they are to become approachable. In common with all monitors, they are capable of inflicting serious injuries with their powerful jaws, long tails and sharp claws. Thick leather gloves should be worn when handling Dumeril’s Monitors, as even tame individuals leave deep scratches with their claws in the course of their normal movements. A single male can be housed with 1 or 2 females, but they must be watched carefully. The nesting area should be enclosed (i.e. a large tub or plastic storage container within a wooden box equipped with an entrance hole) and stocked with 2-3 feet of a slightly moist mix of sand, top soil and peat moss. We have a good deal to learn about captive reproduction. Success (and failure) has been reported under a wide variety of conditions. Please post below for detailed information on pairing adults and incubating the eggs.